Alright, since you cornered me about it, I will admit it. My name is Lucas and I am homophonophobic. First of all, it was just plain fun making up that word. Secondly, my hate and fear of typos is real–especially when it comes to homophones. You know how they are: conniving, backstabbing, and sneaky. I’m not merely talking about in my manuscripts, but everywhere. When texting friends, I edit and re-edit before hitting [SEND]. Even still, sometimes “your” slips through in place of “you’re”. An instant follow-up message is required by Lucas law. If I’m in an online forum with frenzied fingers blurring in rapid-fire responses–and a fat-fingered mistake sneaks through–death. I immediately enter a correction preceded by an asterisk to replace “there” with “*their” or even “*they’re”. Typos in Tweets (Tweetpos?) are the worst. They instantly zip out into the Twitterverse with no tether to yank them back. Tweetpos are irrevocable and fly out to a gazillion recipients at once. Double-death. There is no telling how many times I have posted a comment or status on Facebook, only to re-read it, gasp at my idiocy, and delete it. I recover quickly, however, and can draft a more eloquent version with the necessary change of “its” to “it’s” in mere seconds. 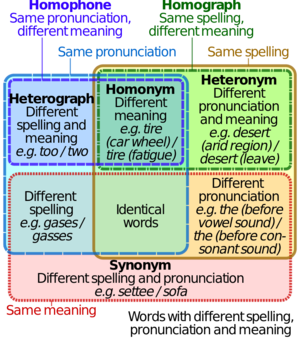 Before this blog entry is posted, I will search it diligently (multiple times…) for not only coherence, rhythm, the best wording, and spelling–but also a separate pass in search of any homophones that fly below the spellchecker’s radar. Why am I confessing my homophonophobic nature? Because I threw up a little bit in my mouth the other day when I discovered “here” in place of “hear” in a blogpost that had been up for days. You can hunt for it if you’d like. You won’t find it. It was eradicated in a zealous hate-crime against homophone misuse. Here is a Euler Diagram to help you take back control of your life if you–like me–are homophonophobic. Caution: It may make you aware of new phobias you never even thought of having. This entry was posted in Editing, Writing and tagged Coming Out, Homophones, Homophonophobia, True Life Confessions. Bookmark the permalink. This diagram makes my nerd side all tingly. I love that you used “your’s” instead of “yours”!!! Perfect. I new ewe mint it. Mishomophonophobia is the fear of incorrectly using homophones.